Custom teacher notepads are our best sellers and it seems everyone have started loving their teachers! What makes these notepads unique? The answer is the word “Teacher”. A teacher is the one who builds the foundation of our public and social life. This means everything associated with them is bound to be special in its own way. 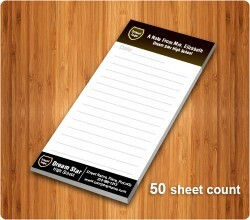 We offer large collection of personalized teacher notepads in this section, which are befitted gifts for teachers. Parents who wish to thank their kid’s teachers for all their care and contribution can always dwell upon these notepads with ease. We are sure that the promotional teacher notepads offered in this section will help to intensify personal bonds between teachers, students and parents. Teachers can utilize it creatively to converse with parents and inform about their kids progress and vice-versa.